So it’s the end of summer, and some of us are lamenting the end of swim and vacation season. But who says the fun has to stop? Late summer can be a rejuvenating time to celebrate the end of one season and the beginning of the next. It’s still warm in Denver, so why not plan a late-summer party and just have it catered by Burchild? With over 20 years experience in the catering industry, we’re the perfect team to provide your party with amazing menu options and incredible service. Need some ideas for your next party? 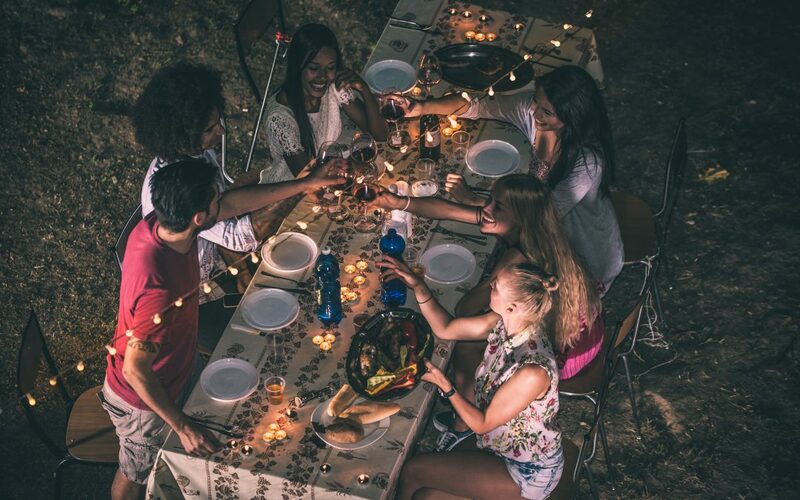 We’ve outlined five party theme ideas, including menus catered by Burchild, to keep the summer going with families, friends, or even coworkers! We all love an excuse to get fancy, but do we need a particular reason? Why not plan your own late summer cocktail party? A mix of the three? Then, decide on how fancy you want this shindig to get. Is this a little-black-dress and black-tie event? Maybe you want to go a step further and have a theme for the cocktail party – like the roaring 20’s. You can really make it something special by renting cocktail tables and linens and decorating each with votive candles and even small floral arrangements. For the menu of your fancy cocktail soiree, Burchild has your back. We recommend bite-size items from our After Hours menu, including Italian meats and cheeses with olive tapenade and marinated artichokes, or try our perfectly roasted shrimp cocktail with crackers and sauces. End the evening with assorted sweets: we offer options from cookies and cupcake to mousse parfait and fruit tarts! Let’s face it, we all need a little pampering. But sometimes visiting a spa is a little out of our price range. So why not make your own spa and bring brunch (and friends) to your place? Invite a handful of your best gal pals over to relax and pamper on a Saturday or Sunday morning for a late summer spa day with brunch provided by Burchild. Nail polish, hair products, or any other items to pamper with! And how about the food? First, choose a breakfast selection, such as our signature Frittata made with farm fresh eggs, vegetables and cheeses, served alongside breakfast meats, delicious pastries, and fresh fruits! For a little bit of a lunch-menu vibe, add in our seasonal crudité display with fresh vegetables and savory dips. Oh, and we’ve got the coffee, too! Whether you’ve got a large and cozy couch or a roomy backyard, having a movie viewing party is a great idea for late summer evenings. If you don’t have a large-screen TV in a sitting room, you can still have folks over by setting up your own movie theater in your house or outside. You can rent a projector that connects to a laptop or iPad to stream a film straight onto a screen. Most rental companies also offer screens and setup services, but if you want just the projector, it’s easy to hang a plain white sheet and make your own theater screen. Now for the movie night snacks. Skip the boring popcorn and just have it catered by Burchild with these delicious menu ideas. Try our taco menu, which includes both vegetarian and meat options: perfectly roasted vegetables and deliciously seasoned meats served with all your favorite toppings – and even cinnamon churros! Expecting a larger group? Keep it fresh by pairing with our salad option: includes roasted corn with peppers, grilled strawberries as well as a Tex-mex style black bean salad and a Caesar salad option. This menu also comes with cookies for your after-dinner sugar craving. School has just started but the kids still get to play! Plan a never-ending-summer party day in your own backyard for the kiddos in your life (or your own inner child!). If you’re thinking catering is only for adult functions, think again! Our menus are family friendly. For this party, try either our Southern Friend menu with crispy southern-style fried chicken, potato salad, green beans, cornbread and even apple pie. Or for the BBQ lovers, you can’t go wrong with smoked brisket and chicken with homemade BBQ sauce, coleslaw, potato salad, and Texas toast. End the meal with cookies and brownies and some of our fabulous tea lemonade. The title of this party idea speaks for itself: for the football fanatics in Denver (go Broncos! ), kick off the 2017 season with a party catered by Burchild. Whether you plan this get-together at your home or in your workplace, we can provide all of your favorite game-day snacks. All you need is a watchable screen or viewing area – and maybe your favorite jersey. There are plenty of great menu ideas for this party, but how about bringing the backyard in with our Backyard BBQ menu? We serve all-beef dogs and Angus beef burgers, along with grilled corn-on-the-cob, potato chips (made in house! ), and all of the perfect toppings – even the ketchup and mustard. In the mood for sandwiches? We do that, too. Try our sandwich buffet complete with deli meats and cheeses, potato salad, coleslaw, and a variety of toppings and condiments to make everyone’s perfect game-day sandwich. We also provide tasty chips and cookies! Whichever party you plan, Burchild Catering can deliver with plenty of delicious meal and beverage options and professional, friendly staff! Call us at (720) 838-0781 or click here to request a quote for your late summer party, catered by Burchild.